This year CERF focuses on business, especially it's a business to business exposition. SEDONA gives free invitations to all clients (actual or potential) that wants to stay in touch with latest technology and solutions from IT designed for business. All you need to do is send us a email on office@aparaturafiscala.ro with "CERF" in subject and your following details: Your Name, Name of your Company, Position. 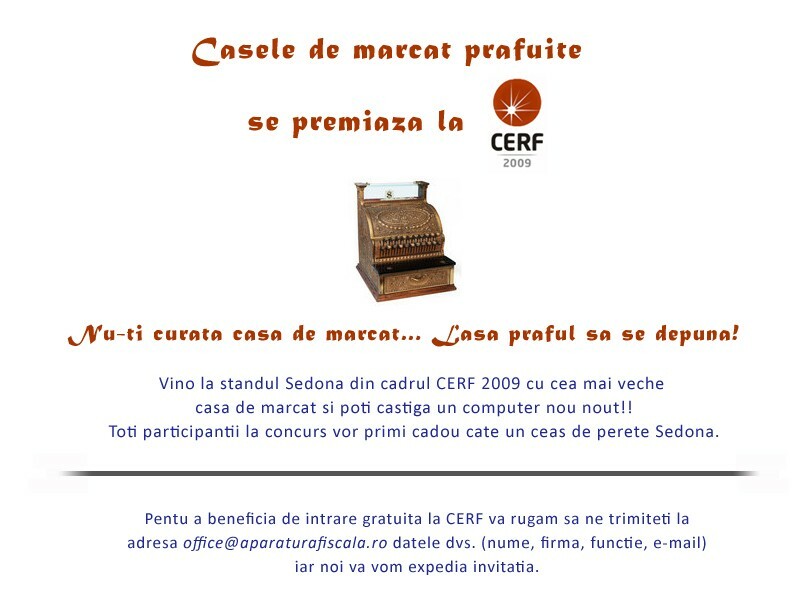 We prepared a special contest: "Oldest cash register form Romania!" Join us to our location together with your old machine. In real time your effort will be rewarded. The winner will receive a brand new Computer-PC and the rest of the participants will win a wall-clock branded with SEDONA. To its second participation at CERF, SEDONA presents latest technology for restaurants and retail. At our location you can discover newest touch-screen POS from Aures and IBM; retail and restaurants software that includes latest functionalities; money counting machines. Also you will discover complete solutions and services for restaurants and retail.